An advanced instrument landing system is up and running at Belfast International Airport after being successfully installed by NATS, the UK’s leading provider of air navigation services. The Indra Navia Instrument Landing System (ILS) and associated Indra Distance Measuring Equipment (DME) represents the airport’s latest investment in state-of-the art technology that has been designed and developed to assist the safe landing of aircraft during poor weather conditions in which pilots are unable to establish visual contact with the runway. 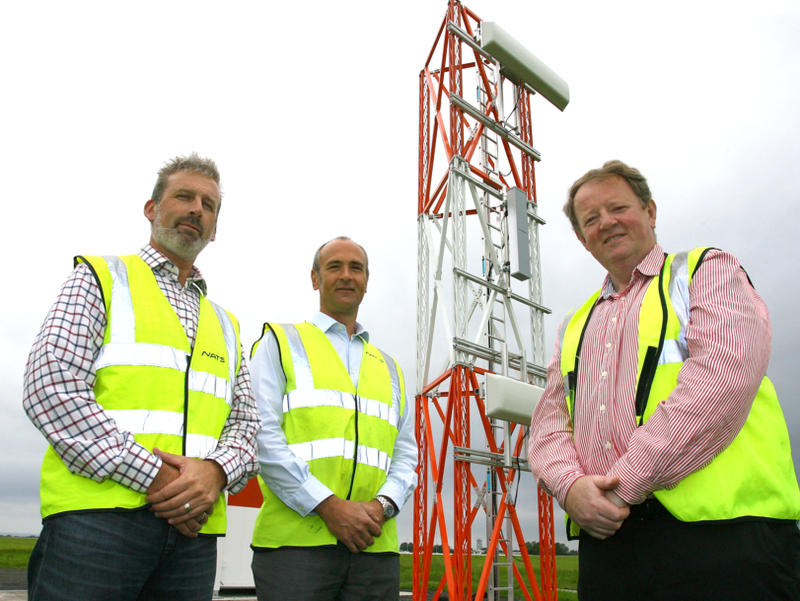 By transmitting radio signals giving horizontal and vertical guidance, ILS technology is designed to act as a valuable precision runway-approach aid; Belfast International’s new Indra LDB-103 DME is the first of its type to be installed at a UK airport. Undertaken during the early summer months of this year, Belfast International’s instrument and antenna upgrade was completed by the NATS NAVAID installation team with no disruption to airport operations and flight schedules thanks to careful planning and co-ordination with stakeholders, resulting in a seamless transition of several key ILS services. Michael Cockcroft, NATS’ Air Traffic Services General Manager at Belfast International Airport, said: “It was good to see the various teams within NATS working together to meet our customer’s needs and expectations. This exciting project has been delivered without any negative effect on service delivery and no erosion of safety margins. Work to replace the runway’s existing ILS with the new Runway 25 Indra Navia equipment, including a new localizer and glidepath antenna systems, started in mid-June. “Careful management of the new antenna systems construction, which took place in front of the old structure, allowed operators to switch from one system to the other during the upgrade. This allowed us to ensure reliable continuity of service throughout the project without impacting either system’s performance,” added Michael Cockcroft. Graham Keddie, Belfast International Airport Managing Director, said its investment in upgraded equipment gave the airport a clear advantage in the aviation sector: “This important work was carried out during our peak holiday period with no disruption to services. “The safety of passengers and aircraft is our number one priority and this equipment upgrade underlines that commitment. We are regarded as an airport of choice whenever pilots decide to divert in bad weather and now our status will be further enhanced. The replacement system successfully completed its Site Acceptance Testing and Commissioning Flight Inspection in July and, after more than 300 hours of Category I service without incident, the new Runway 25 ILS system was successfully upgraded to Category III in early August. It is now in full operation at the Northern Ireland airport.